Finally, the day is here. After months of preparation, Woodland Park Zoo has meerkats again—behind the scenes at the moment and getting ready to debut to public on May 1. At 10:20 a.m. today, the zoo’s eight new meerkats arrived after a long and arduous road trip of about 1 hour from our neighbors at the Point Defiance Zoo and Aquarium in Tacoma. 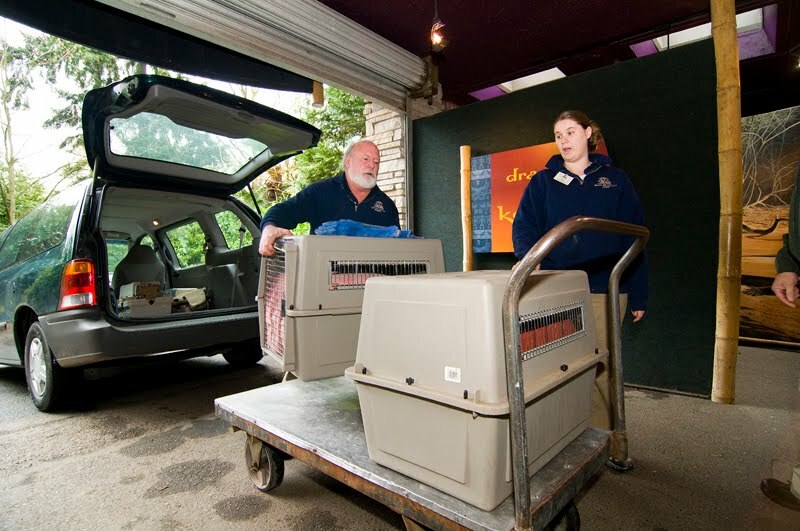 Actually, this is one of the shortest trips that an animal has taken to get to our zoo! They arrived sporting their own fingerpaint markings on their heads and backs to help keepers identify them more easily during their first few days here. The colors chosen are combinations of pink, green, yellow and red, and will fade in a day or two. Eventually we will be able to tell them apart by just looking at their faces, but for now they all look the same! Keepers will monitor them very closely for the rest of the day and possibly into the night just to make sure they settle in okay. They will be introduced to their new exhibit in the next day or two. We'll know more about their personalities after they get comfortable with their new surroundings. Since the beginning of the year our very talented exhibits crew has been working to convert two existing enclosures in the Adaptations Building into an exhibit that will transport our visitors to the Kalahari Desert, where meerkats are found. You will be astounded at what an artist can do with concrete and paint. Next up we’ll be doing a health screening. This includes weights and parasite checks. Most zoos’ animals are monitored closely for medical issues so we don’t expect to find any concerns. Our hope is that we’ll have eight, healthy meerkats that accept each other and live harmoniously in their new digs. However, meerkat group dynamics are very complex so if things don't go according to plan we have a plan B. Stay tuned for more details. What happened to the previous Meerkats? Died? Wow! cant wait to see them! This kind of behind the scenes article is really great, love to hear more! May 1st! Hope all goes well and they adjust to each other and the digs!! Looking forward to seeing them in action. It’s been 10 years since we’ve had meerkats at the zoo. 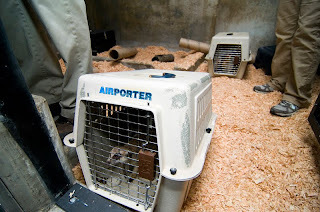 We had only one left that we transferred to another zoo because they are social animals and we wanted to ensure it would be part of another "mob." The Komodo dragon exhibit moved into the area that the meerkats formerly occupied.